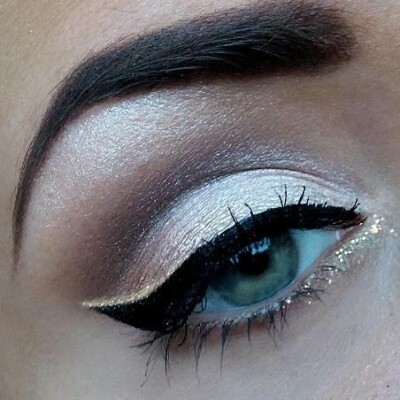 This festive season is the perfect excuse to add a dramatic twist of gold to your classic eye makeup for oodles of glam. We tell you how to perfect gold winged eyeliner as well as a golden smoky eye in a few simple steps to help you dazzle this Diwali. Get ready to add some shimmer to your lids to sparkle this season! 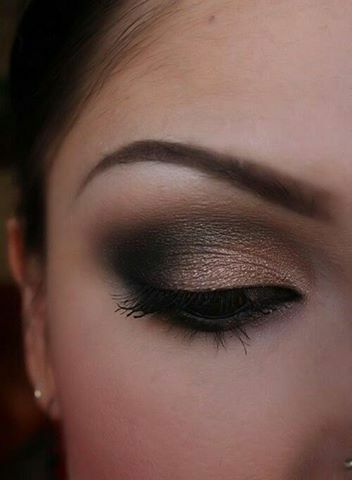 Step 1: Using your eyeshadow brush, sweep on a light brown shadow over your entire lid. Add some along your lower lash line as well. Step 2: Add your gold eyeshadow starting from the inner corner of your lid till the centre of your eye. Use your angled brush to apply it along your lower lash line as well. Step 3: Next, apply your shimmery beige shadow from the centre of your lid outwards; do the same along the bottom of your eye as well. Step 4: Take your angled brush and, using a steady hand, swoop on a thin wing from the outer corner of your eye and pointing towards your temple, using your gold eyeshadow. Repeat on the other side. Try these eyeliner hacks to make sure your flicks are even on both sides. 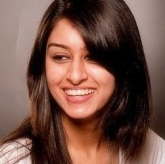 Step 5: Define your peepers using a black gel liner and a thin eyeliner brush and a hint of kajal on your lower lash line. Step 6: Brush on some mascara for that extra oomph with flirty lashes. Step 1: Take your bronze eye pencil and line your eyes on the top and bottom. Make sure to get as close to your lash line as possible and then take a Q-tip to blend the edges. The soft texture of the pencil will help your shadow grip on better and stay on for longer. 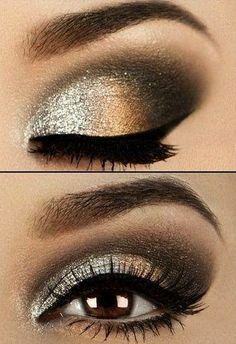 Step 2: Using your eyeshadow brush, sweep on your gold shimmery colour all over your lid and along your brow bone as well. Don’t forget to blend super well. Step 3: Using an angled brush, take your bronze eyeshadow and define your eyes on the top and bottom. Blend it in. Remember, there are never any harsh edges or defined lines in a smoky eye. Step 4: Sweep on a darker shade like a dark brown, grey or even a bit of black eyeshadow and apply it around and above your crease, surrounding your shimmery gold eyeshadow. Take your brush and blend it in. Step 5: A generous sweep of mascara is all you need for a look that is high-voltage and fabulously apt for a big Diwali party or wedding function.